I popped over to a friend's house on Monday to talk models and aviation. It was a delight to be able to see almost complete builds of Hasegawa's big flying boats Emily and Mavis - such impressive and beautiful airframes - a Hasegawa Nell and to notice the relatively small size of Hasegawa's Hiryu by comparison. Comparing Hiryu with a Ventura made me think how little credit the Japanese designers have been given for the finesse of their streamlining, particularly the close cowling of radial engines. I also got to see the AZ Models Ki-48 "in the plastic", so to speak. The nose didn't look too bad to me, although I wasn't able to check it against plans (and which plans? Plans by the same draughtsman Hasegawa based their Ki-43 on???) and I'm mindful that most of the comparisons have been made between photographs of the model taken from the upper side quarter and photographs of the real aircraft taken from the lower side quarter. As the lurker might say - hmmm. No, a more immediately apparent disappointment about this kit pointed out to me - and with which I agree - was the rather milky opacity of the clear parts. Special Hobby's big Fiat Br.20 was impressive in the box, although no option for a Japanese version is included. An interesting discussion on Japanese Fiat Br.20 camouflage colours followed. Four colour upper surface btw - but you'll have to wait for that - and all your models are wrong! ;-) By the by my host is the lucky owner of a copy of Andrea Degl'innocenti and Umberto Postiglioni's valuable classic 'Colori E Schemi Mimetici Della Regia Aeronautica 1935-1943' published by CMPR in 1977 with real paint chips, and which is now the literary equivalent of hen's teeth. Beyond the scope of this blog but my friend's collection of Japanese armour was also admired, the latest partially built or still in box and including some exotic resin from Japan for the Type 89. 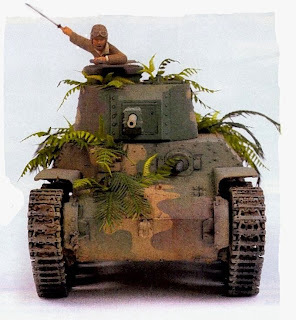 There is a most interesting build of the Fine Molds Type 97 Shinhoto Chi-Ha (Improved Turret) in Issue 47 of Model Military International magazine which relates the perhaps apocryphal story of the last minutes of Captain Nakazawa's life. The author Luke Pitt eschewed Mr Hobby's "parched grass" on the grounds that it had "way too much green" and used a home-brew instead. Pity and it just goes to show . . . . The end result is more than impressive though (image above). In the same issue is an interesting article on the Type 97 Kai Shinhoto Chi-Ha by Bruce Culver with a colour photograph of the world's only operable Type 89 clanking along. Finally there is a Type 97 colour walk around of the survivor at the US Army Ordnance Museum. Definitely an issue for the Japanese armour enthusiast should any stray here by chance and a temptation for those Japanese aircraft modellers wanting a change. All in all a good day out and but for car troubles a perfect one! Tanks mate! Your kind hospitality, the sharing of treasure and the conversation was much enjoyed and seeing me safely home at the end of the day very much appreciated. Image credit: ©2010 Luke Pitt & Model Military Magazine International.